This sun hat has passed UPF 50+ test, could block 97.5% or more of sun UV rays. Suitable to wear in Spring,Summer,Autumn and Winter, Beach, Travelling and other outdoor activities. HIGH-END MATERIAL: Superior polyester fabric guarantees lightweight and breathable quality for the sun hat. UNIQUE STYLE: You could pull your pony tail out the back. The floral leaf pattern underneath the brim makes your sun hat different from ordinary ones. It is foldable for easy storage, quiet convenient. 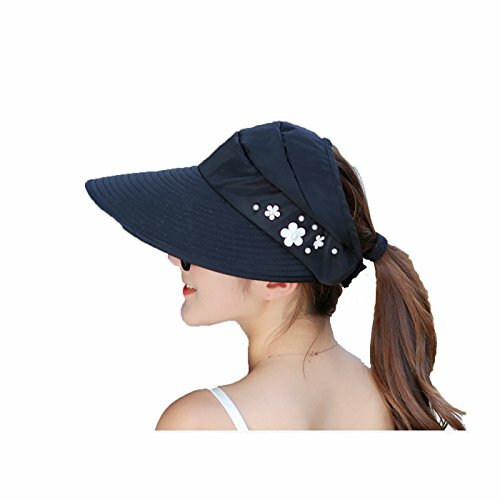 ACKABLE & LIGHTWEIGHT: Rolled up convenient to carry and absolutely save lots of space.It is a perfect hat for beach, pool, park, fishing, hiking, camping, travel, hunting,gardening or any outdoor sports and activities. If you have any questions about this product by ULUIKY, contact us by completing and submitting the form below. If you are looking for a specif part number, please include it with your message.